FIFA World Cup DVD Collection! 15 Discs - 24 Hours! Get your face paint on! is the ultimate compilation for soccer fans! in 1990, USAs successful tournament in 94. Even go behind the scenes for thetotal World Cup experience. 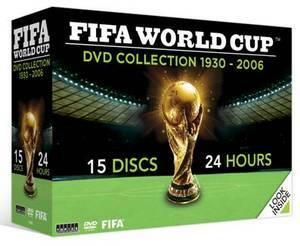 headers and much, much more!- 15 DVDs featuring 24 hours of World CupTM history. - 15 bonus Top Ten lists  150 amazing moments in soccer! 15 Disc Set 24 Hours!